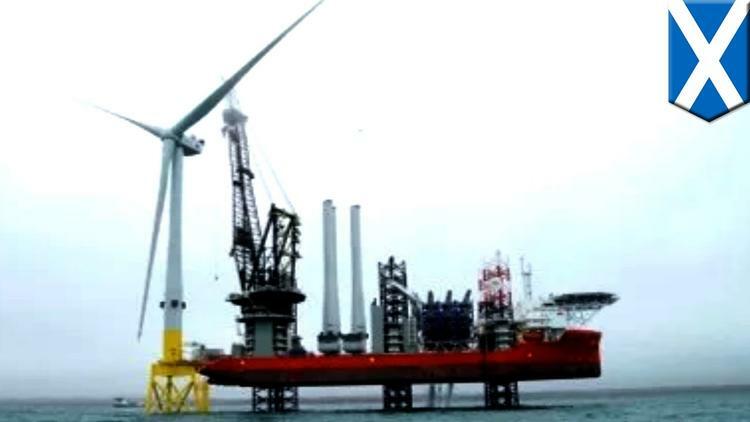 Ann Arbor (Informed Comment) – Scotland generated enough wind power from onshore wind turbines in October to fuel electricity for five million homes, that is, virtually the entire country. Wind is so obviously the future that the utility Scottish Power has sold its gas plants and will concentrate entirely on wind. In fact, the situation has turned so bad for fossil fuels that their one advantage just evaporated. It is already cheaper to build a new renewables facility than a new coal or gas plant, and once built, the energy is virtually free. But it used to be at least that with the sunk costs out of the way, it was cheaper to go on running a fossil fuel plant than to build a whole new facility. Solar, hydro and marine account for about another ten percent of electricity generation. Scotland is not great for solar, which accounts for only 4% of its electricity capacity, but in summer cities such as Aberdeen can get a lot of their electricity from it, and it works fine for heating water. Scotland’s last coal-fired power station was destroyed in a controlled explosion last week. Scotland hopes to net be carbon zero in its electricity generation by 2020, and is on track to succeed. Of course, other carbon-producing sectors also need to be addressed, including transportation, construction and agriculture. Sweden has committed to be net carbon zero in all sectors by 2045. The United Kingdom as a whole had earlier dragged its feet on renewables, I think in part because its upper crust is heavily invested in the oil giant BP and depend on it for their retirement earnings. But renewables are growing so rapidly that now 30% of British electricity is from wind, and renewables electricity generation in the third quarter of this year exceeded that from fossil fuels for the first time.